If you have any idea of who I am, and if you’re reading this as a personal friend of mine, you will know that I have the most severe case of Peter-Pan syndrome. For some odd reason I have stayed frozen in time at the age of 12. So you can only imagine the excitement I have for Disney giving us a long-awaited new installment of those iconic puppets sorry Muppets. Again, if you have any idea of who I am you will also know that the Muppets have been to blame for much of my childhood fantasy world. In fact the first sence of glamour I had in my life was due in part to Pig. This crazy bunch in all respect means “something” to all of us. The new film due out this thanksgiving, has had a no holds barred marketing campaign. It’s almost hard to not get excited about this film. Early this last month, The Green Album was given a reinvention. Bands such as OK GO and WEEZER all covered songs from that iconic album realised in the late 70s by Kermit the Frog. Along with the Green Album, a strong line of merchandise surfaced to accompany the album’s art work. The Merchandise all powered by Threadless.com, for those not familiar with the site, graphic designers from all over, gather on this site to share their art work. In some cases major power brands like DISNEY, will select art work for a product line. From the Merchandise even to the Green Album cover, are all from the site, Threadless.com has become my new obsession, like I need another obsession. All this talk about the products, its Disney after all, whats Disney without product? There is also much talk about the Film, that was trying to make a surprise when it came to the guest appearances in the film, but thanks to twitter, we now know whats to come and im not talking about celebs. We in the fashion world are going to be doing double takes on many of the costumes. From Miss Piggy, to our beloved frog, surprising items will for sure be jumping out at us.The new Movie on the Muppets spared no expense on the iconic characters, and the custom designs didn’t take for granted the star power of these monsters and animals, and the DIVA that is Ms.Piggy, clearly had no budget. Ms. Piggy had several custom-made CHANEL suits by Karl Lagerfeld, so yes it true, the suit that seems to mock the CHANEL looks is in fact CHANEL. Marc Jacobs and Zac Posen aswell lent a hand in designing costume pieces for the divine swine. 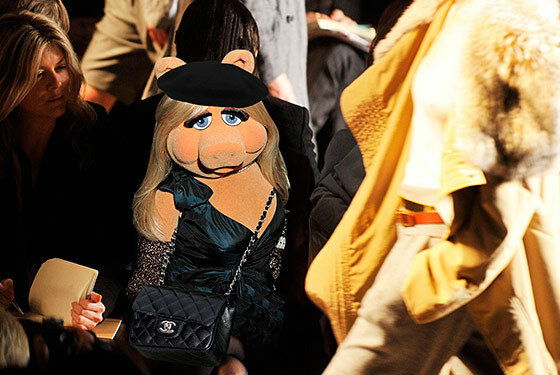 In the Film, Ms. Piggy plays a an Editor at French Vogue, which im so hoping Anna Wintour will put her on the November Cover, (Bacon & Birkins, perhaps) As Diva as she is, Ms. Piggy is not the only one rolling around in fashion heaven. Kermit the Frog, Gonzo, and Fozzy Bear, have all be fitted for tailored suits from Brooks Brothers, with an apparent referral from Ralph Lauren Himself. Who knew?, well we sure do, we fashionistas are for sure going to be loving all this eye candy that Disney and many holier than thou designers are providing for us. One more thing, in true DIVA style Ms. Piggy will also have 3 custom-made porky pumps, by Christian Louboutin, if you can only see m face right now at this news. The return of the Muppets this fall is going to be Big. This entry was posted in | and tagged Chanel, christian louboutin, disney, fashion, Kermit the frog, Miss Piggy, The Muppets, Threadless.com, VOGUE. Bookmark the permalink.